SparkFun is no stranger to the world of Kickstarter. In April 2014, we partnered with GeekAmmo to bring you the incredible MicroView, a chip-sized Arduino-compatible module that absolutely smashed its fundraising goal. We also brought you the MaKeyMaKey, another wildly successful Kickstarter project, which we helped design and manufacture. So when Quin Etnyre, of Qtechknow fame, approached us with his great idea for the Qduino Mini, we were excited to get involved. Quin tagged us as an ideal manufacturer of his design because of our commitment to open source (the Qduino Mini is 100% open sourced) and our chops in the world of Kickstarter fulfillment. We've known Quin for several years (and in fact sell many of his ArduSensor Learning Kits). Not only is he a talented hardware designer for a 14-year-old, he's just a plain ol' talented hardware designer. A battery charger circuit - Just plug into USB and it charges the battery with the auto switching circuit - there's no extra charger needed & no digging the battery out of your project. A battery fuel gauge - Tired of guessing when your project will run out of juice? We've got you covered - it has a simple monitor library for your battery so you can remind yourself when it needs a little extra juice. An ultra-small, ultra-thin, ultra-light design - The Qduino Mini itself is 1in x 1.5in (2.6cm x 3.9cm) & 0.18oz (5 grams), perfect for quadcopters, drones or high-altitude balloon projects. Both the Qduino Mini and the batteries (LiPos) used to power the board are super compact & thin, just right for embedding in your projects. As we mentioned above, the entire design is open source (which we love! ), so you can customize and change it to suit your needs. 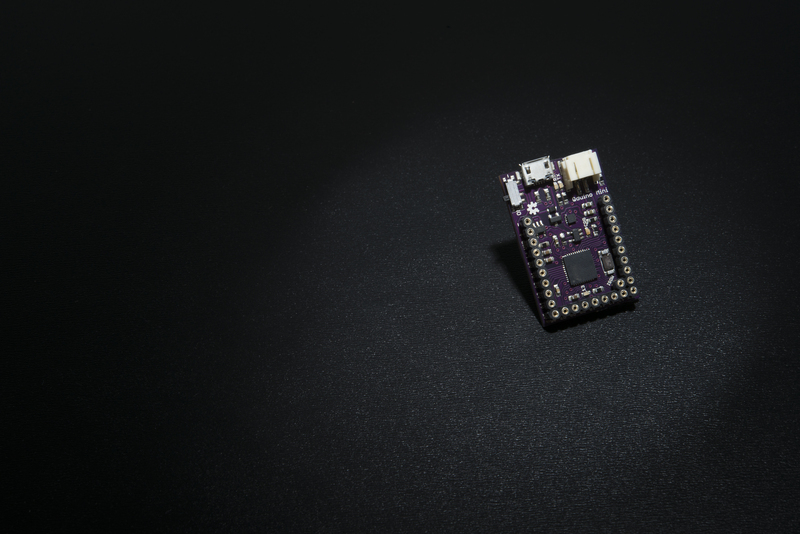 Click Here to Get Your Qduino Mini! We are very excited about Quin's latest design, and we hope you'll join us in supporting this great new product! Head over to Quin's Kickstarter page for lots more details on the board and to grab one of your own! Wow! 14 years old? Way to go, kid! Backed! Backed... Good luck little guy! Ordered 1. :) Nicely done. This seems a great product... and I put $ where mouth is. But with units shipping, a little more technical info might not be before time? For instance... battery? Would a Sparkfun Polymer Lithium Ion Battery - 1000mAh PRT-00339... be suitable? (I realize that I have to decide if it holds enough charge for my wants. Other than that: suitable? That should work fine. The Learn kit actually comes with an 850mAh battery which is close to the size of the Qduino. Really any of our single cell lipos should work fine (technically the charge rate might be above spec on some of the smaller batteries though). The only unfortunate thing is that having a battery plugged into the battery connector prevents having the USB port flush with any kind of enclosure. So any design you make has to leave a lot of room to open up and plug in the USB. Consider one "vote" for how you have it in V1.0 being just fine cast, please. Turn the battery connector 90 degrees so it faces the same edge of the board as the D6 pin. Then the board may be mounted at the corner of an enclosure with some degree of access to both the USB port and the switch, and the battery connector will be out of the way. Very cool! I was looking at the kickstarter page and was wondering. The qduino uses the atmega 32u4, just as the pro micro but the page says it runs on 3v3 at 16Mhz. Then why is the pro micro running at 8 on 3v3? No problem still pretty cool! Does it work similar to the spark fun pro micro? And does it also work without a battery attached, so just usb? sorry the shipping cost is too expensive for non-US backers. I will wait to buy it on Sparkfun later. For those wondering: the extra shipping cost is mentioned in the project's description. The "Ships anywhere in the world" does not imply that shipping is included. Hopefully Quinn will make some updates that point this out, as he's bound to have backers who missed that. The fault lays with Kickstarter - they're still doing a terrible job of conveying shipping costs to backers, and project creators often have to do a kludge either in the description or in each pledge level's text. I know that I have to add shipping cost. (We always have that as a EU backers) but, 24$ for a 29$ product, it's too expensive. In addition we would pay customs fees... (maybe not but it's not included in the 24$ shipping cost.) The microview had a free shipping option for EU backers.